Enjoy the new and improved 30-Day supply of Lean Complete Vanilla. This deliciously satisfying meal replacement is a smooth, high-protein shake. 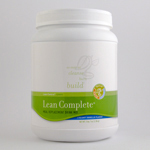 Lean Complete helps build a lean, healthy body with essential vitamins, minerals, and natural fibers. Two scoops mix easily with 8 oz of water, skim milk, or soymilk. Enjoy Lean Complete in place of one meal per day. - New Formulation! - Improved Taste! - More Vitamins! - More Protein! - Lower Carbohydrates!